Oil-rubbed bronze is a very beautiful color that stands out when installed with an undermount kitchen sink. The selected faucet can make any kitchen look expensive and high-end. But not all products make the grade, and in the world of kitchen faucets where design is paramount (faucet water filters can affect the style although they are necessary), these sub-par products just won’t sell. The following brands have perfected the look and have produced some of the best looking oil-rubbed bronze kitchen faucets the world has ever seen. We have decided on these 8 that all come from well known faucet brands that represent high quality and design. The first one on the list is the Delta 4353 a Pull-Out faucet that made in into second spot for the Best Pull-Out Kitchen Faucets. The other on the list are all different types of faucets with various features sets so there should be something there for everyone. Take advantage with its multi flow ability that alternates between 1.5 GPM and 2 GPM. It inludes 10 ½-inch escutcheon and the spout is 10 inches long and 8 inches high. This is a 4-hole, 8-inch installation with a swiveling spout that turns a full 360 degrees for clearance purposes. The side sprayer matches the faucet perfectly. The included reflex system makes handling long hoses easy. Installation is handled by the Duralock quick connect system. The arch is high at 16 ¾ inches with full 360-degree movement, and it is capable of a flow rate of 1.8 GPM. Docknetik is a magnetic docking system that keeps the spray head in place. The spout height measures a nice 7 3/8 inches with a lever that is ADA compliant. Moen has a LifeShine finish guarantee and water flow is limited to 1.5 GPM. This item was inspired by nature, resulting in a very nice design that gives a room presence that many will appreciate. With a medium price tag, many will consider this water efficient product a steal. Using the enhanced flow option, customers can fill vases, sinks or pots to further save time and money. But the unique feature of this little kitchen faucet is its multi flow ability that alternates between 1.5 GPM and 2 GPM depending on whether you want water efficiency or high performance at any given time. This is a great feature that mostly benefits AC power users, since water can run up energy bills. Customization is easy with the included 10 ½-inch escutcheon, though it is completely optional. The spout is 10 inches long and 8 inches high, with a very distinct look that separates it from the competition. If you need to move about a lot, the 59-inch hose is a blessing in disguise and will keep you from having to limit your movements. Not bad for the first item on the list, which, in the end, may turn out to be the best of them all. Designed to fit 4-hole, 8-in. Using a classic design is the beautiful looking Delta Foundations 21996LF-OB Two Handle Kitchen Faucet with spray — a ridiculously low priced kitchen faucet with a lot of desirable features. The side sprayer matches the faucet perfectly, which is a must if you are going to have the sprayer as a separate entity from the faucet. The operation is strong, although it won’t blow anyone away power-wise. This is a 4-hole, 8-inch installation with a swiveling spout that turns a full 360 degrees for clearance purposes. The hose isn’t as long as the first item, but it still provides enough reach to get around the counter area for miscellaneous tasks. The flow rate is 1.8 GPM at 60 PSI, giving you just enough “oomph” to get the job done. Compared to others on the list, the all-brass construction is very subdued, but has a charm of its own. Taking the price into consideration, this is a great buy but doesn’t land it a spot at the top of the list. This is worth the purchase if you want something with a classic look that won’t distract in a room. Moen makes its way onto the list with the medium-priced Brantford — an elegant looking kitchen faucet that is sure to turn heads. Available with and without motion sense, it has one of the best oil-rubbed bronze colors with a deep undertone that really makes it pop. The included reflex system makes handling long hoses easy so that buyers can move around the kitchen freely without fighting the faucet. It never gets tangled or in the way, even if you stretch it to the fullest length. Installation is handled by the Duralock quick connect system, a revolutionary new way of installing kitchen faucets that’s known to be a Moen keepsake. The included escutcheon is optional but recommended since it has the same beautiful tendencies as the faucet that will be installed, and is definitely recommended if you want full compatibility when installing with a 1- or 3-hole system. With the longest hose on the list at 68 inches, there are few that even come close in terms of flexibility and ease of use. Moen wins again and provides a kitchen faucet that is worth a look. Kohler offers a darker version of the oil-rubbed bronze than the others on the list, with a nice glare that almost looks chocolate in the right light. The arch is high at 16 ¾ inches with full 360-degree movement so you can move it out of the way when the dishes are stacked too high. An optional escutcheon helps with 1- or 3-hole installation, but isn’t as brilliant looking as the previous one on the list. With its traditional stylings it will look good in modern or fused kitchens, with a full metal construction that is capable of a flow rate of 1.8 GPM. Spray head functions include pause, sweep spray, and streaming modes. The button at the top makes all of these modes easily accessible and simple to use. Docknetik is a magnetic docking system that keeps the spray head in place when it is not in use — a technology that lasts for the lifetime of the device. So far this is the most advanced kitchen faucet on the list, with a lot of extra features kicking around. Buyers that are more concerned with the functionality of the faucet than the look will find solace with this one. This medium-priced kitchen faucet from Moen has a nice rich oil-rubbed bronze color, one of the more natural looking ones on the list. If the striking light and dark accents don’t grab you, then the wonderful features of the faucet itself will. Installation of this item is a piece of cake with the Duralock quick connect system offering a tool-free, hassle-free installation. Moen has a LifeShine finish guarantee so there’s no risk of the finish tarnishing, corroding, or flaking. So for buyers that value the finish of a faucet and have had past issues with it fading over time, this guarantee is attractive and a great incentive to buy. On top of that guarantee is the limited lifetime guarantee that protects it against defects, with welcoming customer and email support. The spout height measures a nice 7 3/8 inches with a lever that is ADA compliant. Water flow is limited to 1.5 GPM, so it is no powerhouse but still gets the job done. Having one of the best oiled-rubbed bronze colors on the list makes this a good buy for consumers that want a great looking product. Second to last on the list is another Delta faucet — the Leland. It has a medium price point and a cute teapot- style design that has made it one of the top-selling faucets in the industry. The series is most famous for its rich colors, notably the bronze that looks rich and full of life. The 59-inch hose goes moves just about anywhere in the kitchen that you do and if you have a small sink, the faucet swivels 360 degrees to give you more space when needed. Three-hole mounting is supported with the included escutcheon, a plate that has the same beautiful bronze color as the faucet itself. Water flow is the average 1.8 GPM and the product dimensions are 9.2 x 12 x 9.2 inches as a deck mounted install. The spray head is very useful on this model since it is multi flow, alternating between spray, stream, and even higher outputs to give you the desired power. InnoFlex PEX supply lines are included and keep water inside the faucet so that metal contaminants won’t get in. This is another highly recommended product with features and a look that are hard to beat. Last on the list is this high-priced Delta 9192T-DST Addison that has received major praise specifically for its bronze color. Considering that there are a lot of colors available for this model, the bronze finish stands out and is a testament to how great it looks on this faucet. Using the multi flow feature lets customers choose between a water efficient 1.5 GPM setting or a power infused 2 GPM setting at the press of a button. There is no drooping spray head after repeated use thanks to the MagnaTite docking system, a revolutionary system that uses magnets to pull the spray head into place and keep it there. This is also another Touch2O system, meaning that the handle and the faucet itself just need a slight touch in order to activate the water stream and turn it on or off. Using your elbow, finger, or whatever you want will allow you to keep from spreading germs in the kitchen when cooking. Another cool feature that doesn’t get enough mention with this model is TempSense technology which uses a color indicator at the base of the faucet to let you know the temperature of the water. This is one of the best ones on the list with a lot of cool features, and it is not surprising that it is from Delta. One of the first really high-priced oil-rubbed bronze kitchen faucets on the list is this Delta Pilar with Touch2O technology. It has one of the highest arcs available and a sleek and unique look, complementing the main bronze color so that it stands out in any kitchen. Apart from the awesome visual appeal of the Pilar, users will notice that, underneath the hood, this is a very advanced kitchen faucet. Touching any area of the spout or handle causes it to turn on or off, so when you have dirty hands and don’t want to get it all over your beautiful faucet, this would be the perfect one to have. MgnaTite docking technology ensures that the spray head stays in place with the use of a powerful magnet to keep things in check. Batteries are included with the system, so that’s a small saving to start out with. With the metal construction making this device extremely durable, it really stands out on the list as one of the top picks. Worth the high price, many consumers will be happy with this Delta. If you are on the hunt for the best oil-rubbed bronze kitchen faucets, then you may find that there are tons of options to choose from. These faucets have become really popular in modern kitchens, so brands have stepped up their game and now provide a lot more options. Below we have put together a buying guide to help you learn more about the buying process and what to look for when searching for your oil-rubbed kitchen faucet. Oil-rubbed bronze kitchen faucets have become increasingly popular, and although most brands provide faucets in this color, not all of them are the best faucets to choose from. Below we will take a look at some of the more popular brands and the faucets they provide in this color selection. Delta is a well-known brand that is high regarded and has been around for quite some time—so, it comes to no surprise that they have some of the best oil-rubbed bronze kitchen faucets available to choose from. If you are looking for one of these beautiful faucets to put in your kitchen, you will find that Delta offers the color for all design, style, and mounting option. They have traditional, modern, and transitional faucets as well as more innovative and techy options. The only downside buyers may notice is that this color option seems to be more expensive when compared to other color and finish options the specific model provides. If you are even remotely familiar with faucet and other fixture brands, then you will definitely recognize the name Kohler. This brand is highly-rated, and they offer great faucets that fit all budgets—with their affordable options being pretty low on the cost spectrum when compared to other similar faucets. Like Delta, the Kohler brand also provides faucets of all styles, types, and designs in this color choice—from two-handle and single-handle to widespread and more selections with more unique designs. You will also find that most Kohler oil-rubbed faucets are more affordable then other popular brands—although they do have some expensive one’s to choose from. Kohler is pretty big on offering water-conserving faucets to help consumers not only save on their water bill, but also provide them with more eco-friendly faucet selections. If this is something that is important to you in a faucet, we highly suggest you look into the Kohler brand. Moen is known for their innovative designs and beautiful products and they have made sure to offer many of these options in oil-rubbed bronze options. 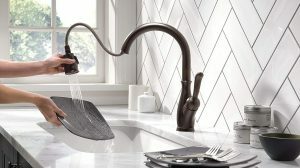 Buyers will find that Moen offers all design, style, and mounting options—and they did not skimp on any of these features with their oil-rubbed bronze selection. In fact, Moen probably offers the most selections in this color—they even have it available in their pull-down faucets as well as their larger kitchen faucets. Overall, the Moen brand has succeeded in making some the most beautiful oil-rubbed bronze kitchen faucets without sacrificing any of the features in the other color options. So, if you are looking for a beautiful faucet that will not only simplify your life but also look great, then Moen is the way to go. They have, by far, one of the more extensive selections to choose from. Pull-down faucets are by far the more option of these two types of faucets. They have become highly popular in the modern kitchen and are the go-to option for most buyers. Both of these faucets have an attached sprayer that, the difference is that the pull-down faucet has a sprayer that (like the name suggests) pulls down; while the pull-out faucet has a sprayer that you can pull towards you. Most buyers prefer the first because it’s easier to manage. The single-handle faucet is another popular kitchen faucet that uses a single lever to control both the pressure and temperature of the water. These faucets are really popular in kitchens, but it really just depends on your personal preference. Overall, this is a great option for everyone, and they are available in just as many color and finish options as all other types of faucets. Just like the name suggests, double-handle faucets come with two different handles. Each handle controls a different temperature—hot or cold—and this type is the more traditional option. You can purchase these with a deck plate or without one—it just depends on whether you want the all the pieces attached to the same base or if you want to mount each of them separately. This type of faucet may also require separate supply lines for cold and hot water—make sure to look into the brand and model before making your purchase if this is something that will deter you from purchasing the faucet. Touchless faucets are becoming increasingly popular—and why wouldn’t they? They are capable of reducing you water waste, decreasing your water bill, and greatly diminish the spread of germs in your home. These faucets use Motion Sense technology that allows the faucet to activate only when you place your hand or object beneath or near the faucet. Many of these come with buttons or levers to control the temperature and they also come in several design options to choose from—so you aren’t sacrificing anything for this added tech. Touchless faucets are also available in all mounting option—they can be wall-mounted, sink-mounted, or mounted on your calendar. So, as you can see, touchless faucets are also available for all preferences, and you will be happy to hear that there are options for almost every budget as well. Commercial style faucets are starting to be a high-demand alternative for today’s modern kitchen. They work great with large, deep sinks, simplify your life, are really efficient, and are a perfect option for buyers with large kitchens. We also can’t forget to mention that these faucets just look great—they’re beautiful, sleek designs will add a modern yet simplistic touch to your kitchen. These faucets are also known as restaurant style faucets since they are typically used in restaurants and commercial kitchens. They deliver a high-pressure spray that will help you efficiently was anything—from your veggies to your dirty pots and pans, perfect for professional and novice chefs alike! That concludes the list, and looking back there were some real stunners that don’t get as much attention as they should. If you’re in the market for an oil-rubbed bronze kitchen faucet then there is definitely something on this list for you. Hopefully brands will continue to produce in this color as it has become one of the darlings in the industry and a customer favorite.